There have been churches on or near the site where the Minster now stands for nearly 1400 years, with the first record in 625 referencing a wooden church which provided the setting for the baptism of King Edwin. The current building was started around 1080, after its Anglo-Saxon predecessor was severely damaged during the harrying of the North, and took around 400 years to emerge into the building we see today. The Norman Minster was the vision of Archbishop Thomas of Bayeux, who oversaw the building of a vast cross-shaped cathedral between 1080 and 1100. This Minster forms the footprint of the current cathedral, and the remains of its Transepts and Nave walls are still visible in the Minster’s Undercroft museum. 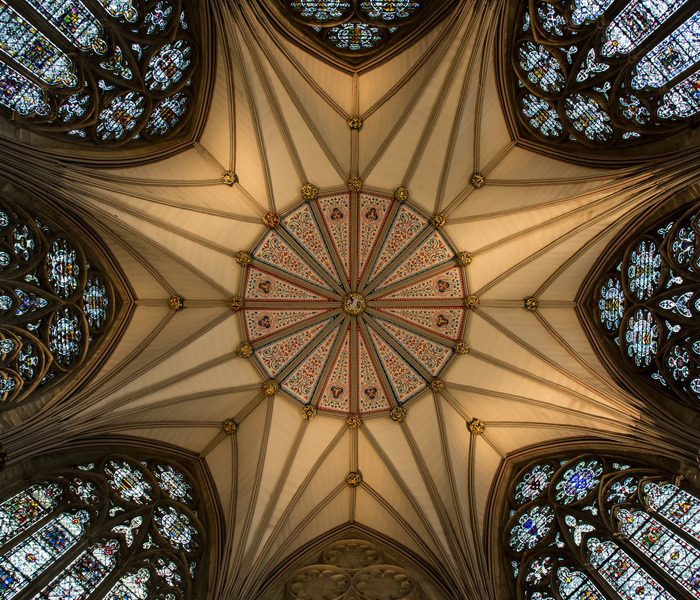 The earliest part of the Gothic Minster was built between around 1225 and 1255 under the vision and patronage of Archbishop Walter de Gray, who wanted York Minster to be one of the greatest churches in the kingdom. 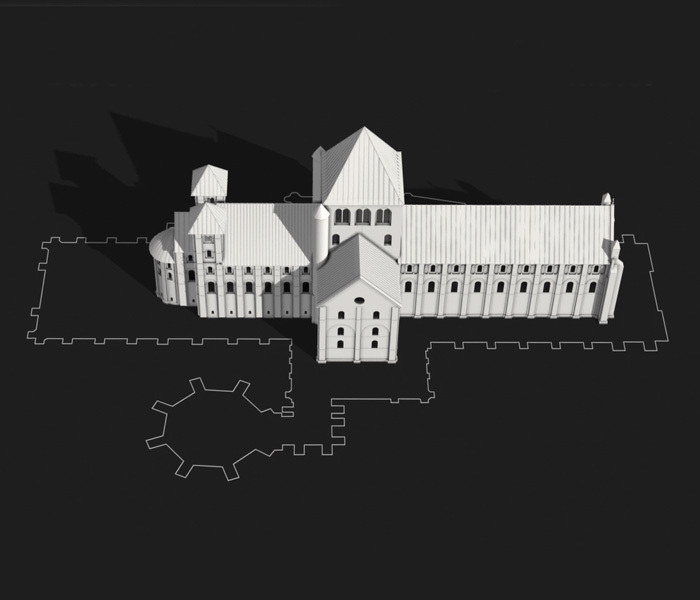 Changes included the rebuilding and expansion of the Norman cathedral’s two Transepts. Over the next two centuries, many of the current Minster’s most recognised architectural gems were created. The Chapter House was finished in the early 1290s, with its vaulted ceiling unique at the time of its creation because it is not supported by a central column, but instead by timbers in the roof. In 1291 work began on the Nave we see today. It took more than 60 years to complete, with the finished product measuring 63m long, 32m wide and 29m high, making it the highest and widest medieval Gothic Nave in an English cathedral. At its end lies the Great West Window, which was completed by 1340. 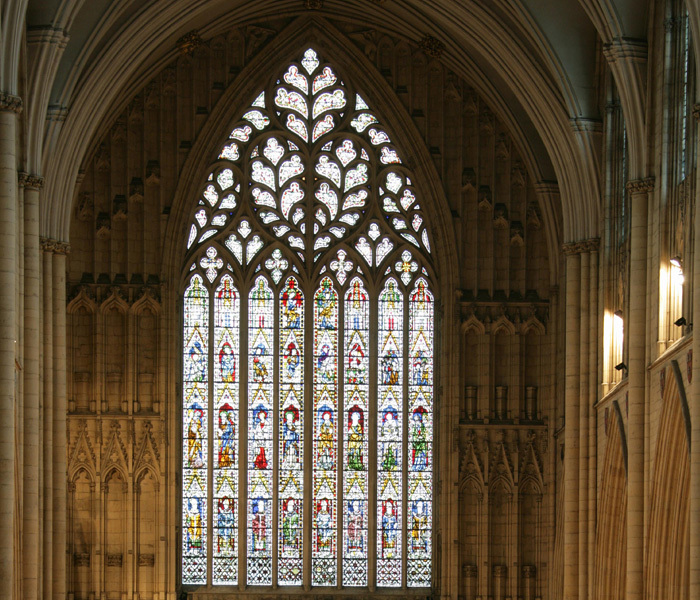 The window, which is nicknamed ‘the Heart of Yorkshire’ due to the shape of its upper stonework, illustrates the authority and purpose of the Church. Other notable features in the Nave include the statues which line the triforium, many of which are missing their heads after they were damaged during the reformation in the 16th century. Once the Nave was complete, work began on the current East End (1361) followed by the Quire (1394 – 1420). In 1405, an unexpected project was added to the workload when a section of the Central Tower, which at the time housed the Minster’s bells, collapsed in a storm. In 1407, Henry IV sent his own master mason William of Colchester to help with the work to rebuild the tower, and he remained involved until his death in 1420. Finally in 1472, York Minster was judged to be sufficiently complete for a re-consecration, which took place on 3 July of that year. Our stonemasons still use the skills and techniques passed down through the centuries from their medieval predecessors. You can see our expert craftspeople in action at York Minster’s international Stone Carving Festival on Saturday 18 and Sunday 19 August.